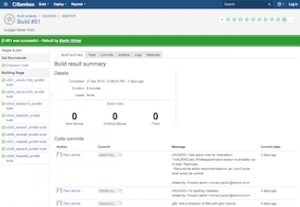 The CI System is based on Atlassian Bamboo and builds Quagga on multiple platforms and executes some tests. At this time, the tests are still limited. We are working on integrating more of our tests into the CI system. As of today, this plan builds Quagga on multiple platforms (Ubuntu, CentOS, Debian, FreeBSD, NetBSD), runs the DejaGNU tests and builds test binary packages for each of these platforms. Detailed documentation on the system and each of the setup on each OS can be found at https://git-us.netdef.org/projects/OSR/repos/ci-files/browse/doc. The system runs automatically within an hour from commits to the master branch of Quagga.